The entrance of the Pétarel: calm and charm .. Completely independent, Lou Petarel offers a well light living room with a large window that opens to south-west. A wood stove, to keep you warm and a compact kitchen, make up the rest of the first floor. On the second level, up the small stairs, you discover one large bedroom with a queen size bed and a large closet. You’ll also find one the toilet and separate bathroom with a sink and a shower. 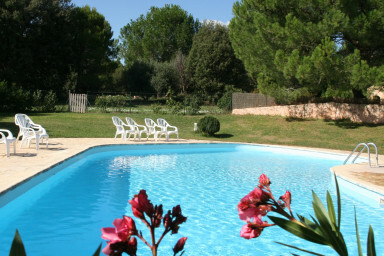 Its large terrace with a private yard completes the space providing the French “douceur de vivre en Provence”.